The SDD3000 is the latest high precision gyroscope to benefit from the US Government’s declassification programme. 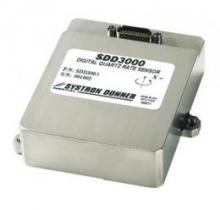 This high performance, digital, single-axis gyroscope, manufactured by US based Systron Donner Inertial (SDI), incorporates an advanced Quartz MEMS sensing element. It is optimized for applications that require low noise and excellent stability over changes in temperature and vibration. SDI’s proprietary Quartz MEMS technology delivers high reliability and a low total cost of ownership, with no wear-out modes or required calibration intervals. Boasting a small size, light weight and very low power consumption, the SDD3000 is truly a leader in its performance class. The SDD3000 combines an advanced sensing element with state-of-the-art digital signal processing (DSP) technology, yielding superior performance through even the most demanding conditions. Delivering unprecedented low Angle Random Walk values (output noise) and class-leading stability among MEMS gyros, the SDD3000 is an ideal solution for stabilization, precision pointing applications, instrumentation, motion sensing and GPS/AHRS integrations.